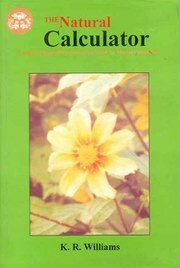 The Natural Calculator is an elementary book on mental mathematics. Each of the nine chapters covers one of the Vedic Mathematics formulae. The main theme is mental multiplication but addition, subtraction and division are also included. Indian Mathematics belongs not only to an hoary antiquity but is a living discipline with a potential for manifold modern applications. Vedic Mathematics was rediscovered from ancient Sanskrit texts earlier this century by Bharati Krsna Tirthaji (1884-1960. He found that all problems in pure and applied mathematics can be solved easily with the aid of sixteen simple Sutras, or word-formulae, for example all from 9 and the last from 10 or vertically and crosswise. This may sound incredible but the Vedic system offers a very different approach to mathematics that is both powerful and a fun. The Vedic system is a system of mental mathematics. It has a coherence and beauty that make it very attractive and some of the methods are truly amazing in their efficiency and simplicity. Many schools now teach Vedic mathematics and a common response from children is: "Why were we not shown this before?" The Natural Calculator is an elementary book on mental mathematics. Each of the nine chapters covers one of the Vedic Mathematics formulae. The main theme is mental multiplication but addition, subtraction and division are also included. A detailed introduction outlines the benefits of mental calculation. Kenneth Williams has taught Vedic mathematics a several colleges and schools in he UK, has been researching Vedic mathematics in e 1971 and has written fifteen books on the subject covering a wide range of topics. He has given many courses/seminars/talks around the world an has done great deal to disseminate and promote Vedic Mathematics as well as opening up many new areas of research.